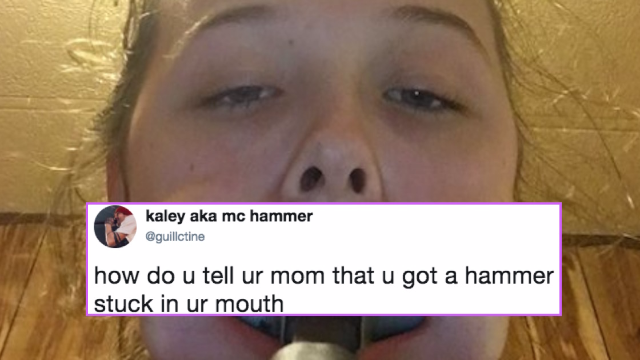 Teen somehow gets hammer stuck in her mouth. The internet laughs and laughs. According to BuzzFeed News, a 14-year-old named Kaley was talking to a friend about how attractive she found a member of the K-pop group BTS to be, and offhandedly said "He’s so beautiful I could shove a hammer in my mouth.'" Well, her friend called her bluff on that, and so Kaley doubled down and actually shoved a hammer in her mouth. There was only one problem: she couldn't get the hammer out. Geez, talk about a hammerhead (I have hammer puns for days, people). "How'd you get those scars?" Luckily, Kaley managed to remove the hammer after about 10 minutes of trying to wriggle it out (and didn't knock any of her teeth out in the process). Nailed it. Hey, we are glad she managed to remove the hammer, but you probably aren't the sharpest tool in the shed if you are eating hammers in the first place.